2013 Pro Bowl to be Played in Hawaii, a Week Before SB XLVII - Fantasy Football, Fantasy Football Rankings | Mac Bros. The 2013 Pro Bowl will be played at Aloha Stadium in Honolulu, Hawaii, for the 33rd time. The game will be televised live on Sunday, Jan. 27, on NBC at 7 PM ET and again serve as the signature event to kick off the week leading up to the Super Bowl. We don't exactly do sportsbook reviews around here, but if we were betting men we'd say the Pro Bowl isn't long for this world. CBS will televise Super Bowl XLVII a week later on Sunday, February 3, from the Mercedes-Benz Superdome in New Orleans. "The players believe that the Pro Bowl is an important tradition,” said NFLPA President Domonique Foxworth. “We worked hard with the league to make sure the best players in the NFL are honored for their achievements on the field." The NFL’s All-Star Game will be played the week before the Super Bowl for the fourth consecutive year. The 2012 Pro Bowl on NBC was watched by an average of 12.5 million viewers, the second most-watched NFL All-Star game since 2001 behind 2011’s game (13.4 million viewers). 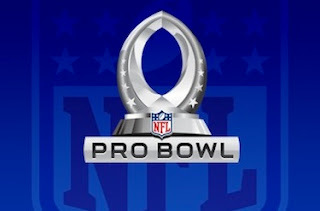 The Pro Bowl was the most-watched all-star game in all of sports in the 2011 season.